Mamaearth celebrated first launching anniversary on 5th December and on the same day, I have received a surprise gift that includes 3 new launched products, 2 cute paper masks of tiger and panda with a very beautiful and good quality bag. Let's have a look at those newly launched products. Nourishing Baby Hair Oil is a certified, dermatologically tested, light and nourishing hair oil. It is a nonsticky, mild and gentle on baby's scalp. This hair oil enriched with the goodness of jojoba oil, almond oil, avocado oil and Vitamin E, promoting soft and healthy hair growth. With Coconut Oil and Almond Oil that penetrates hair roots deeply and nourishes them. Avocado, Almond, Lavender and Coconut Oil soothes the cradle cap. With no harmful chemicals, mineral oil, parabens and artificial fragrance that best for baby's scalp massage and hair. Clean Cuties Skin Cleanser is a toxin-free, certified skin product. It helps to remove stubborn marks of crayons, sketch pens, permanent markers, ball pens, kajals, lipsticks etc. from babies delicate skin in a minute. This Skin Cleanser completely free of harmful chemicals like SLS, paraben, mineral oil, alcohol, and artificial intelligence. It also suits babies sensitive skin. This set is of three lip balms comes specifically for moms that enriched with strawberry and coconut oil, for the baby which has made with coconut oil and calendula and last one for papa which has contained cocoa and coconut oil. This is a perfect family pack lip balm set for winter. It has a travel-friendly and hygienic packaging. 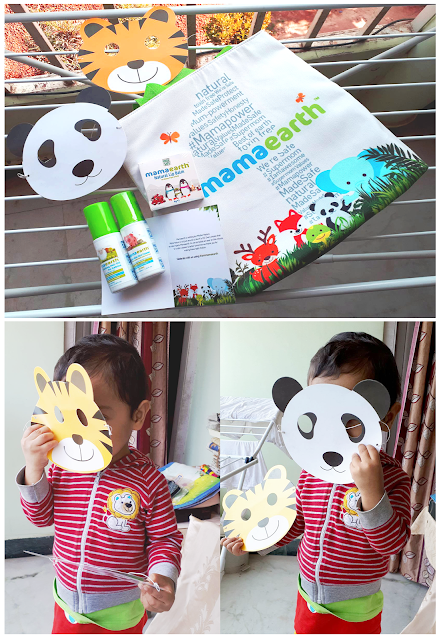 Mamaearth has always ensured high-quality packaging of their products. The hair oil and skin cleanser come in sturdy, white very good quality plastic bottle and pump dispenser that protects the product from any leakage. So bottles are absolutely travel-friendly. I have already started to use these products. Very soon coming up with reviews in details.